After Digging Out Snow, Washington Is Hit With Ice Storm : The Two-Way Meteorologists expect the storm to cause major power outages across the Pacific Northwest. And the ice, which coated the roads, trees, and power lines is continuing the havoc that the snow brought. "It's a very dangerous situation," Brad Colman, a meteorologist in charge of the Weather Service office in Seattle told the AP. "We're expecting a significant impact on power." The AP reports that the storm killed at least one. Authorities pulled a child's body from a car that was "swept away from a grocery store parking lot." "Streets and highways were slick, all three runways at Seattle-Tacoma International Airport were closed in the early morning. Nearly all major school districts in the area were closed. "Tens of thousands of homes and businesses around Western Washington were without power after trees and limbs heavy with snow fell into power lines. "Weather Service meteorologist Jeff Michalski said this is the first ice storm to hit the Seattle area since December 1996." The ice storm warning is in effect until 3 p.m. ET, and the AP reports that while the Sea-Tac Airport's runways have reopened, the taxiways are still iced. The AP adds that just as Puget Sound Energy brought back energy to thousands of customers, thousands more were losing power. ""It's like a storm in slow motion that keeps happening again and again," the power company's spokesman Roger Thompson told the AP. 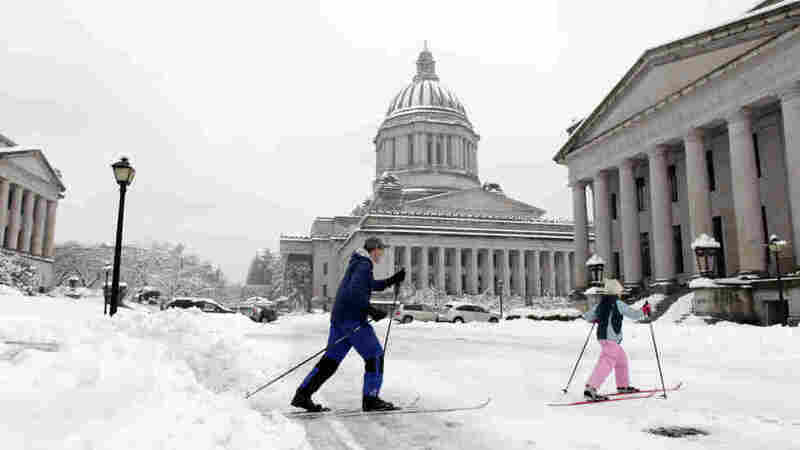 Amelia McHugh, 9, right, and her father, Noel McHugh, left, cross-country ski, in front of the Capitol in Olympia, Wash., on Wednesday. 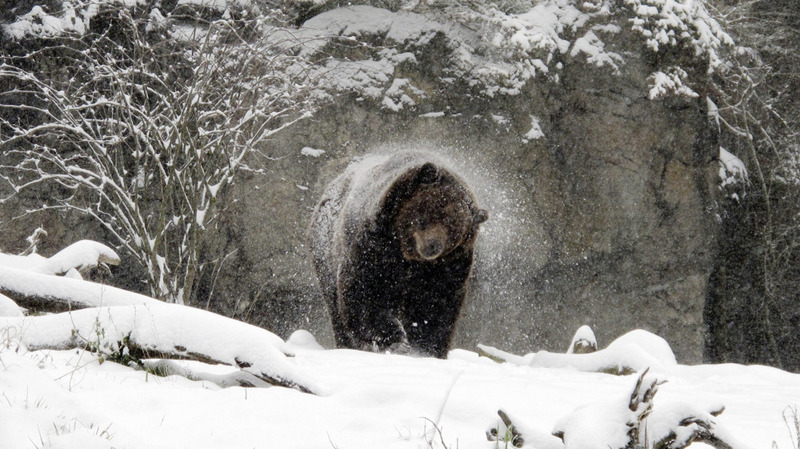 In this photo provided by the Woodland Park Zoo, a grizzly bear shakes off snow in the Northern Trail exhibit on January 18, in Seattle, Wash.